Fast heating, no need to wait, give you a warm winter. Three-speed adjustment, there is always one for you. Easy to operate, you can stand up and enjoy the warmth. Automatic constant temperature control, with overheat protection, the temperature will be too high will automatically close, giving you a sense of security. It has high-temperature resistant heating wire and it is quiet and no voice when working. Unique design style with anti-high temperature safety system, automatic shutdown beyond the scope. The L-shaped textured metal bracket is rugged and simple to avoid collisions and injuries. The double wind wheel directional wind, uniform heating, and rapid heat dissipation. The 50° angle is free to rotate, breaking the tradition and controlling the wind direction. 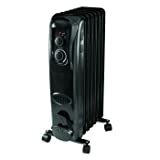 Warm up an uncomfortably chilly room with the Pelonis Digital Oil-Filled Heater in Black. It features a 10-hour timer, so you can run it as long as you need to. 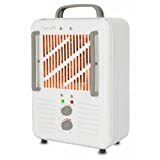 The oil-filled space heater has a safety switch that activates if the unit is tipped over, so you can leave it alone in a room safely if needed. It also comes with an auto shutoff to protect from overheating, giving you a performance that you can rely on. 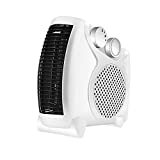 The oil-filled electric heater also has a remote control that is available to conveniently operate it. You can easily keep yourself warm and cozy with this effective and energy-efficient heater. It connects to your household electricity, and you don't have to refill the oil, which serves as a heat reservoir so it never gets used up. The electricity is channeled into a resistor, which turns the energy into heat. This heater can easily be moved around and re-positioned with four convenient and sturdy wheels. Its lightweight design makes it simple to roll around the room as desired. With its slim construction, it can be stored in a variety of spaces when it's not in use. This Pelonis Digital Oil-Filled Heater in Black would make a thoughtful gift for a loved one. The Mainstays Radiant Oil Forced Heater has 3 heat setting and produces a quiet radiant heat. This unit features heavy duty casters, an adjustable thermostat, and a convenient cord wrap. The sleek black color will look great in any room. 3 heat setting, quiet radiant heat, heavy duty casters, adjustable thermostat, convenient cord wrap, Safety Tip Over Switch, Over Heat Safety Shut Off, black. The Comfort Glow milkhouse style heater is a great choice for fan forced electric heat with it's sturdy construction and built-in safety features. The unit is housed in a metal cabinet that includes a carry handle and tip-over guards. The EUH341 features include dual power settings, a built-in thermostat, accidental tip-over shut-off and power-on indicator light. Also included is a 120V, 16 gauge power cord. 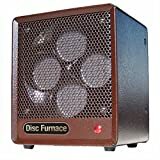 "The Original Brown Box" ceramic disc heater. Kosta Pelonis introduced the first ever ceramic disc heater in the late 1980's. The superior heating performance, high energy efficiency, and sturdy steel cabinet have amazed consumers for over 30 years. Many owners report that their original brown box Pelonis disc heater is still performing exceptionally. The BDISC6 features 4 ceramic disc heating elements that heat up instantly the moment the unit is turned on. The unique structure of each disc maintains the best heating efficiency and most even heat distribution of any portable electric heater. The built-in electronic thermostat helps to maintain a consistent temperature and accidental tip-over shut off shuts the unit down automatically if the unit ever falls over.